There's a million and one foodie subscription boxes on the market and more are appearing every single day, so it's hard to find one that really stands out and us a uniqueness about it. 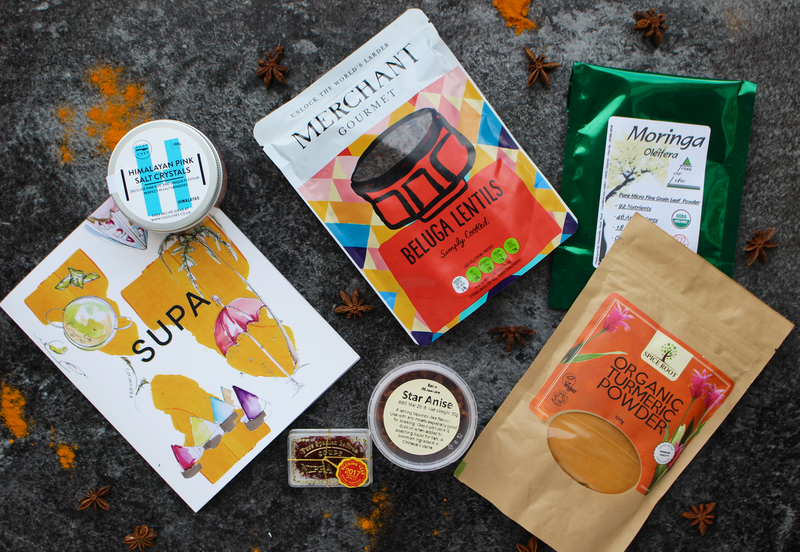 So when SUPA contacting me about trying their new superfood subscription box I kinda of expected the same as every other box out there, but I was delighted to see that SUPA was that bit different. 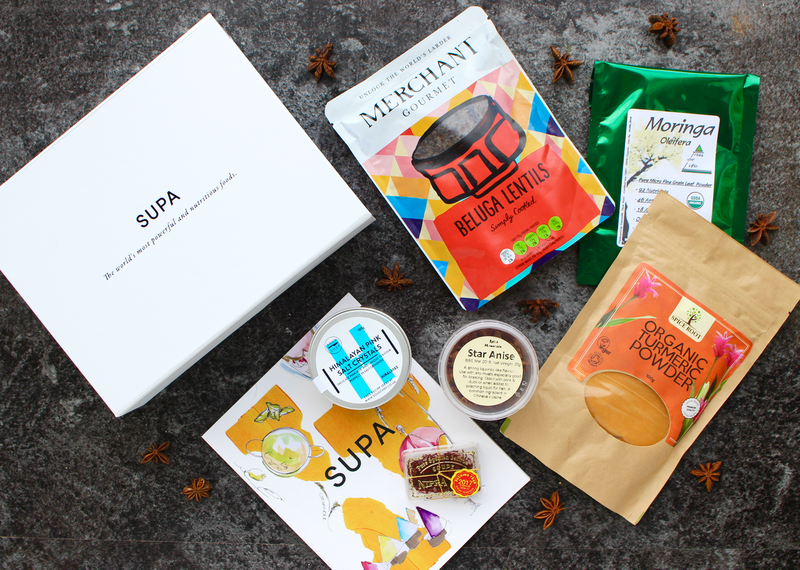 SUPA is a monthly subscription box service that shares the world's most powerful and nutritious foods. 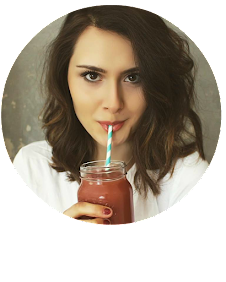 Their aim is to help everyone enjoy the taste and discover the health benefits of real powerful superfoods in a convenient way and be inspired by easy, nutritious recipes which are included in the box. What's different about SUPA is that their products are more superfood ingredient based rather than snack based, and each month brings a new theme. For the month of May, SUPA delivered a little taste of India right to my doorstep and I was so excited to see the diverse, exciting, bright products inside the SUPA box. The May box, inspired by India, was full of amazing products. Some of which I'd tried before and some of which I hadn't! 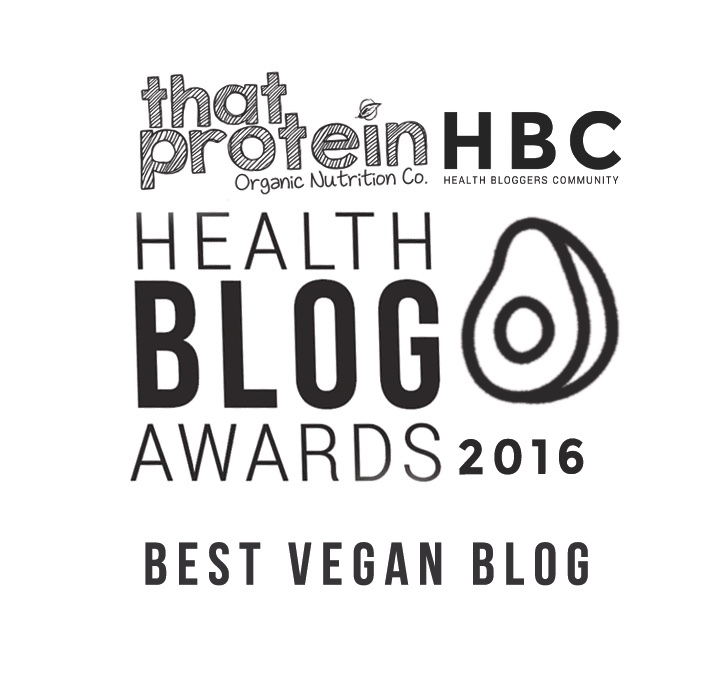 There was moringa powder which is amazing in smoothies, organic turmeric powder which is traditionally used in curries in India but I also love it in soup, turmeric lattes, dips, hummus and even porridge, star anise which is a fabulous spice, himalayan pink salt crystals which I totally swear by - so much tastier than regular salt and far better for you, saffron and a packet of ready-cooked beluga lentils which are actually one of my favourite products, I love adding them to chilli, to salads and mixing them together with loads of veggies and a tomato sauce. Also included in the SUPA subscription box was a booklet that firstly introduced you to this months box and explained the reason behind the theme, then went on to give you a little bit of information about each product and it's place in Indian cuisine and then at the end of the booklet there was a recipe using each of the products from the SUPA box. 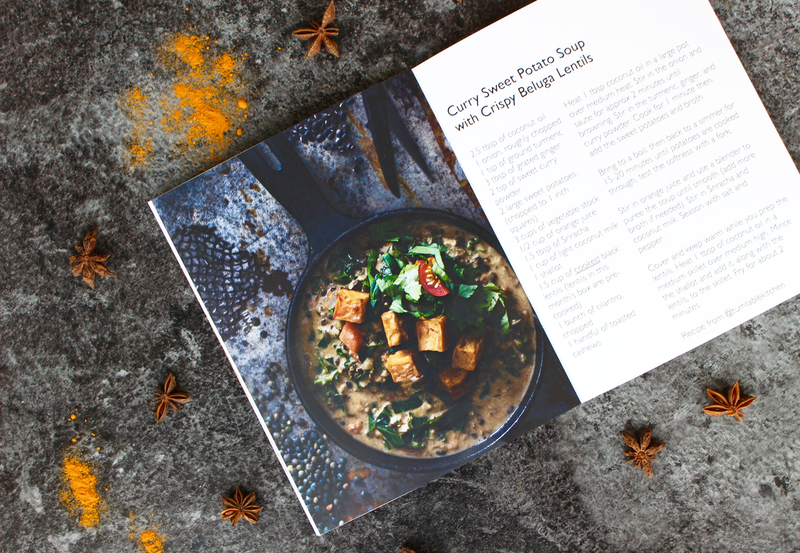 I think the recipe section is great, it's bursting with beautiful photographs and I found it really inspired me to get in the kitchen and start using my new superfood products straight away! It also means if you receive a product you're unsure of you'll always have a way you can use it. You can purchase a trial box from SUPA for £19.99 which may sound a little pricey but you really do get top quality products and wonderful recipes to keep. There's also absolutely no commitment if you choose to subscribe to the box - you can cancel at any time with a money back guarantee. I'm genuinely really impressed with the quality of the SUPA box. You can tell real thought has gone into the products, real passion comes from the team and the added details like the recipe inspiration makes a huge difference. I think this box would be ideal for anyone who loves cooking and would make a thoughtful present for wannabe chefs!